Welcome to Tronster.net: MERRY CHRISTMAS!!!! Well, all you nah sayers and grinches out there. 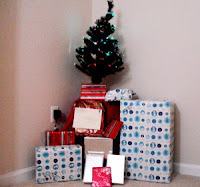 Here I am a single, eligible bachelor and I have a Tree with presents at my place. I expect each of you to get going and get it done. I have sent out all my christmas cards. Many of you may have moved or gotten married and something, and I don't have your new address. I am taking this opportunity to wish you a MERRY CHRISTMAS!. May God bless you this day and all the days of your life. i hope you had a great Christmas and are keeping safe during your travels. Take care!